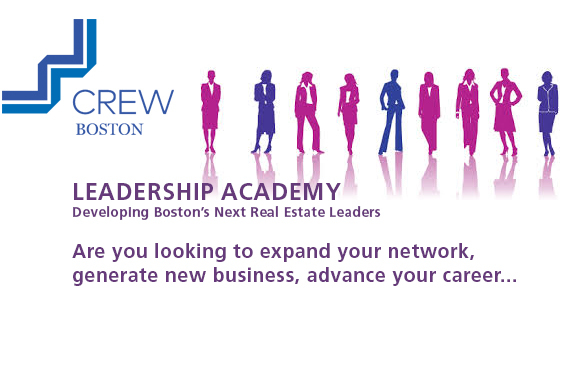 CREW Boston’s Leadership Academy, a program tailored for experienced women in Real Estate who want to accelerate their career into leadership. CREW Boston has created this dedicated 8 month program to provide women in real estate the tools and confidence to catapult to the senior management level. Having a set time to focus on my career and grow as a professional has been helpful, and I really appreciate the input I receive from my peers.I utilized the Direct Speak technique already and it worked really well to turn a difficult conversation into a positive experience. This session introduces the cohort, the program and the program facilitator. Expectations and group guidelines will be agreed upon. This session defines leadership, lays out participants’ leadership vision, specifically incorporating their values, hopes and career ambitions in the context of the organization. Participants will conduct a leadership self-assessment and set goals. Unconscious biases women have about themselves are an invisible threat to women’s careers. This module focuses on helping women recognize and overcome these limiting assumptions through case studies to improve decision-making and risk-taking. Within this context, the systemic biases that exist in the Real Estate industry will be discussed and participants will learn how to manage and overcome these barriers. Participants uncover and overcome resistance to self-promotion and understand the imposter syndrome. They learn how to increase visibility and how to build meaningful networking, mentoring, and sponsorship relationships to accelerate their career – and to model this behavior for their women colleagues. Participants further develop their presentation skills to communicate value, and practice having value-based conversations within and outside of their organizations. Participants learn about the fundamental aspects of corporate finance in the Real Estate industry. Through case studies participants learn the strategic essentials of finance and how to find future resources to help them stay informed and competitive as the market changes. In this module, participants learn to develop a pipeline of opportunities. Whether participants are in an active business development role or not, selling is an important part of business, both externally to potential clients and internally with your organization. Particpants will be provided with tangible tools to generate new business. The final module pulls together the key learnings across the program to transform the participants from individual contributor to strategic business leader. Participants learn how to think and plan strategically, and look at their career with a bigger picture lens. Participants face their resistance to taking risks, getting support and develop a way-forward-plan to measure their progress. Participants also celebrate what they’ve learned and how they’ve developed in the program. As a result of the Academy, I have implemented new tools and am bringing new awareness to my role. As an example, being more mindful of conversations that I have or overhear, and listening for biases in those conversations, is allowing me to be a more active and open listener which is vital to my role in business development. I have also enjoyed the opportunity to meet and network with more women in our industry and consistently find the monthly sessions to be engaging and inspiring. The recent Corporate Finance simulation session provided me with the confidence and ability to read and understand corporate financial statements, as well as know how to use them effectively in decision making. Application deadline for 2018-2019 Program will be May 15, 2018. Thank you for the gift of time to focus on my career development. Jodi has been an outstanding facilitator and has encouraged us to set specific goals and establish tactical steps to ensure our professional success. The Leadership Academy has helped me articulate my contributions and unique value proposition to my company, which has resulted in a salary increase and recognition by senior management.